HOW DO I PREPARE MY VEHICLE FOR TRANSPORT? Please remove all personal items from vehicle. Leave approx 1/4 tank of gas in vehicle. Please make sure vehicle is clean so we can properly inspect it. WHAT IS MEANT BY "DOOR TO DOOR" SERVICE? 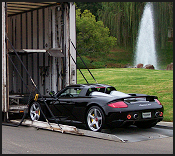 At Premier we make every attempt to pick-up and deliver your vehicle at your desired location. However, due to the size of our transporters, safety restrictions, and legal constraints it may be necessary that we choose a nearby alternate location. WHAT IS MEANT BY "FULLY INSURED"? Once Premier takes possession of your vehicle and inventories it on our vehicle inspection report/BOL, your vehicle is completely insured within the limits of our cargo insurance policy. You are not responsible for any deductible in the unlikely event a damage occurs. CAN YOU HANDLE NON-RUNNING VEHICLES? Yes we can transport non-running vehicles. However it is important to discuss the exact condition of the vehicle with us prior to scheduling the transport. There is an additional fee for this service. CAN I PUT PERSONAL ITEMS IN MY VEHICLE? This is a case by case situation. Our equipment is restricted by weight limits so therefore we may or may not be able to accommodate additional items. It is best to discuss this at the time of scheduling your transport. Please be aware that our insurance only covers your vehicle and does not cover any personal contents. No we do not transport motorcycles. However we may be able to help facilitate this for you. Yes absolutely. Please read our testimonials online or call and we will be happy to provide you with additional references. WHAT FORM OF PAYMENT DOES PREMIER ACCEPT? 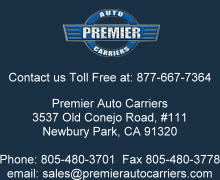 Premier Auto Carriers accepts cash or cashier's check. Please no personal checks or credit cards. We do not require a deposit to schedule your transport. Payment is made upon the successful transport of your vehicle.